The knitting blogworld seems to show that the "needle and wool" Olympians are having some of the same problems as the other Olympians--problems that put us out of the gold! My flower basket shawl was a project to have been completed prior to the Olympics. Well, as you can see in the above photo, I ran out of yarn. 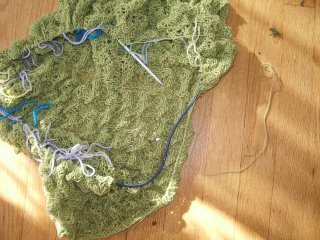 The end is curving up to the right of the shawl. I have one row and the cast off to go. I could rip back one pattern, but I couldn't bear frogging this wonderful lace. So, I went off to the LYS to purchase another skein. So, I now have to finish the shawl and my toddler sweater. I fear I may also run out of yarn for the toddler sweater. I'm using Toasty Toes washable yarn for the sweater. Of course, I didn't match the yardage to that called for in the pattern. I just eyeballed it and said, "oh, this must be enough!" Actually, one skein of the Toasty Toes exceeded the cost that I wanted to spend!!! 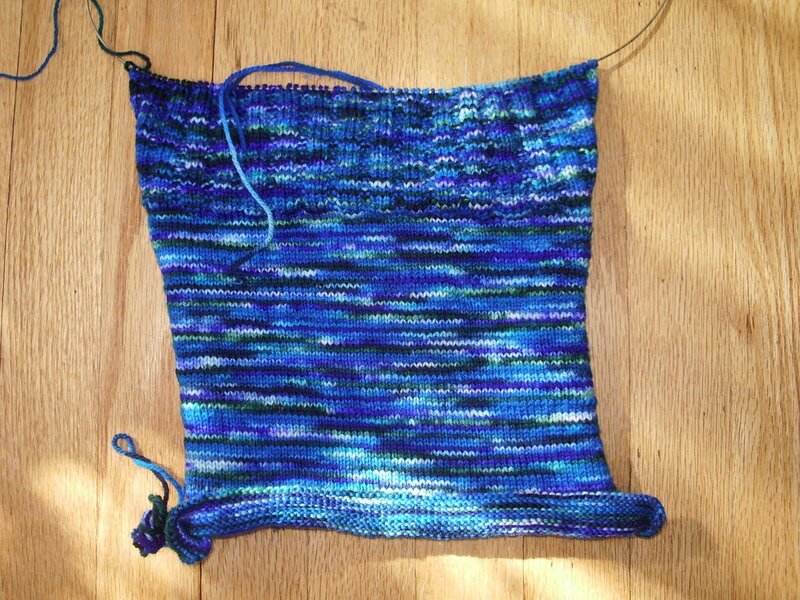 Follow my progress to see whether I need to invest in another big sum for the second skein at the end!! Weather today in the upper midwest if a fabulous, sunny 41 degrees F. This weekend we will go back to the deep freeze of winter. Brrrr. Good time to stay indoors, in front of a fire, watch the Olympics and knit!! I have been reading multicultural children's books this semester for a library course I'm taking and I have lots of recommendations for you with children, or for those of you who also love children's books. For a fabulous picture book, look for "Show Way" by Jacqueline Woodson. A great book for those who love hand craft/arts. I loved "The Birchbark House" by Louise Erdrich, but I know that some kids find it slow going. Try it out for yourself. If any of you have read "Roll of Thunder, Hear My Cry" by Mildred Taylor, you will absolutely love "The Land", the story of the beginning of the Logan family. It will bring you to tears. Try "Shabanu" for a story of a Pakistani girl bound to a marriage she fears. "Bowman's Store" is an autobiography book for adults by an author of books for kids. For a short book that will bring you hope, try "Seedfolks" by Paul Fleischman. I have been listening to books while knitting, indulging two passions simultaneously! i think it's great to listen to books while knitting. i must give it a try. and have you heard about the knit podcasts? i must download them, i've read they're real good. Me too, love to listen to books especially when spinning. If you have lots of time to read children's books, there is a Finnish author Tove Jansson who wrote stories of a Moomin family. It has quiet sort of humor in them. Hooray!!! She claims the gold! Warming up for the medal stand! Oh happy day!! Real Winter for the Olympics!